Not many people in India or else where are aware of or remember one of the biggest maritime disaster in the Indian sub-continent which happened this day exactly sixty five years ago. The event is known as "Great Bombay Explosion". 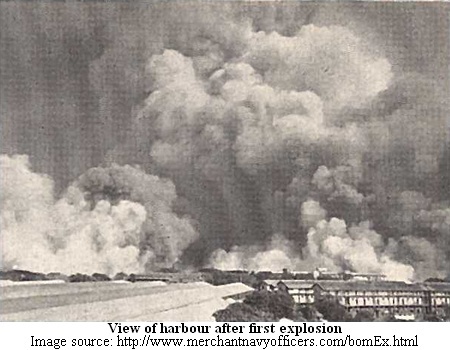 It started with a fire in SS Fort Stikine, which on April 14, 1944 was docked in the Victoria Dock of Bombay (now Mumbai). 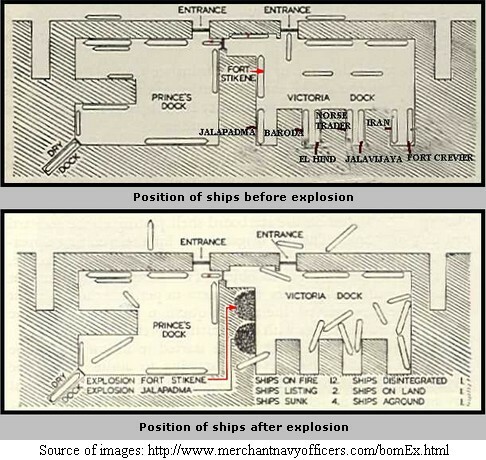 The fire couldn't be controlled and resulted in two giant blasts, scattering debris, flattening the port area, sinking several ships and killing more than 1500 people. 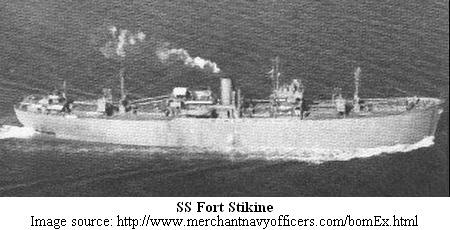 The SS Fort Stikine, a 7,142 gross ton freighter sailed from Birkenhead, England on February 24 via Gibraltar and reached Karachi on March 30 where she unloaded some of her cargo which consisted of but not limited to crated spitfires, munitions, scrap iron, gold bars and around 1,400 tons of explosive. To fill up the empty hold sulphur, cotton bales, timber, lubricating oil drums, turpentine, fish manure, rice and resin etc were also loaded at Karachi flouting all the norms. The ship arrived at Bombay on April 12 but the unloading started on April 14 only. Around 14:00 a fire was noticed in the No. 2 hold and inspite of efforts by the crew and fire brigades/fireboats the fire couldn't be controlled. Thick smoke also hampered the fire fighting operations. At 15:50 the order to abandon ship was given, and sixteen minutes later (16:06) there was a great explosion, cutting the ship in two. A huge tidal wave swept across the dock and ripped ships from their moorings, one ship finished atop a warehouse. At 16:34 there was another explosion. The two explosions were powerful enough to be recorded by seismographs at the Colaba Observatory in the city. 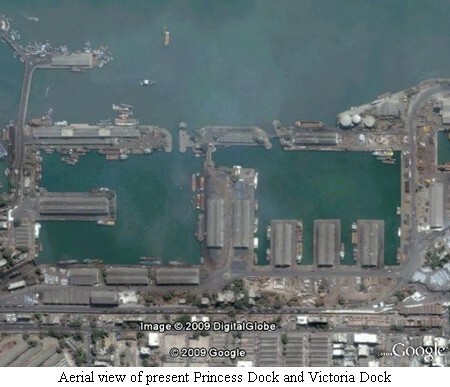 Whole area along the port was 27 neighbouring vessels were sunk or sinking, and the emergency personnel including fire fighters at the site suffered heavy losses. Debris were thrown about 2000 feet (600 metres) high and fell on several civilian populations causing death and injuries to several hundred. The blast also sent a shower of gold ingots over Bombay. The gold bricks also injured several persons. Some bricks fell into the sea and other areas. To the surprise of many gold bricks crashed through roofs and fell in their homes. Exact cause of fire is not known and the incidence was then suppressed and not much publicity was given due to ongoing World War-II. Many persons at time had thought that Japan has attacked Bombay like the pearl Harbour. Dear Brother, thanks for the reminder that I came into this world with a bang. I remember reading the book describing the explosion. Its wonderful of you to have done this research for my Birthday. Hey !! I am looking for this book . Its gone out of publication, is there anyway i can get it !! i am on sapan.g.gandhi@gmail.com. Looking forward for your help on it.